Do you have a stack of newspapers sitting in your house or garage? Whether you like to read the articles, scan the comics or just clip the coupons (like me! ), the daily paper is a versatile resource beyond the information it holds. 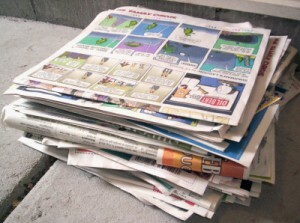 Besides the recycle bin, there are several other uses for newspapers which can help trim your expenses. For very messy clean up jobs, newspapers are an ideal choice. Though a paperless kitchen is a worthy goal, sheets of old newspapers can be very handy for lifting the bulk of big messes (eggs, oil, mud, etc.). The final swipe can be done with a wet cloth or paper towel if needed. You can also prevent a huge countertop spill if you are pouring grease or oil by placing a sheet of newspaper under the container before pouring the liquid. In addition, newspapers are a thrifty, streak-free way to clean windows and mirrors. Glossy gift bags are often an expensive addition to the cost of a gift. By using your own materials to create a gift bag, you can save cash and reduce consumption. Use a trimmed cereal box “wrapped” in newsprint for you bag. Poke holes and thread with ribbon (strung with pieces of plastic straws!) for your handles. You can also customize the bag according to the recipient or what you are giving. For example, for a sports fan, use the sports section; for a general gift, use the comics; for a cooking-related gift, use the food section. 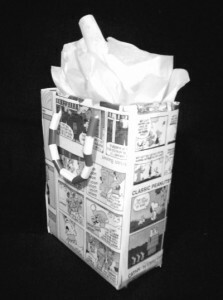 If the gift is too big to fit in a bag, simply use the newspaper as wrapping paper. Wrap a table in sheets of newspaper and secure with tape. Why buy a single-use tablecloth when you can easily get newspapers for free? I noticed that a popular food magazine () recently featured a brown paper table cover for a casual outdoor party. Instead of buying anything, “go green” and reuse your newspapers for the same effect. Using a cardboard box, some newspaper, tape and colored tissue paper, you can have fun making and then breaking your own . Tape is easier and quicker than paper mache, but you can go whichever route your creativity and available time indicate. Homemade pinatas can become a fun, frugal, personalized tradition for birthdays and other celebrations. Changing the diaper of a squirming baby or toddler is not always a tidy affair. Using a newspaper is cheaper and more eco-friendly than buying disposable changing pads, but just as convenient. Through being resourceful with the newspaper stack that you already have, it is possible to save money and reduce your need to buy specialty paper products. Do you reuse newspaper in a clever or frugal way? I’d love to hear your tips in the comments! Julia blogs at . She is a stay-at-home mom of three children who employs her creativity in the kitchen and at the craft table with whatever she has on hand. as low as $1 per week with Discounted Newspapers! Do you have an idea for a guest post? I am always looking for high-quality, original (i.e. not published anywhere else online) content with tips and ideas December212012® readers can use. If you would like to submit a guest post, please follow the Guest Posting Guidelines. @Alicia @ Alicia’s Homemaking, Great idea, Alicia. Thanks for adding to the list! @Deanna, Good ideas! I think I’d better get some melons and try it out! I have used newspaper to make little pots for seedlings. It’s very easy. My husband makes giant pinatas. I have used newspaper to clean my windows and have tried it for cat litter too but I didn’t care for that one. @Dawn, sweet!!! LOVE that idea! Why haven’t I thought of that before?? I have always used newspaper as gift wrapping paper.Like idea #3 as a picnic table covering. you can also use damp newspapers to prevent weeds from growing in your flower beds. Just put them down and put your mulch over top. Used it as my garden weed preventer last fall. And it worked great! No weeds this whole Spring or Summer seasons. I love it! Highly recommend to every gardener. @Kim, I am definitely going to implement this one. We have no money to buy landscaping fabric at the moment; it is great to know one can go weedless for free! @Kim, Great to know! I was planning to try this this fall. I’ve also read it’s a great way to prepare new flower beds without digging up a bunch of grass. You just need to make the papers a few layers deep. Fall is the best time to do that, and apparently, earth worms like to break down the papers as they decompose. We made paper mache pumpkins last year using strips of newspaper and extra party balloons instead of buying the real pumpkins. 1 day to make and dry. 1 day to paint using craft paint (I always have on hand). They were less expensive than buying real pumpkins, and I just stored them away to use again this year. @Daisy, Where did you put the pumpkins? Indoors, I assume? @Julia, Yes, indoors. Although I was able to set them outside on Halloween night by the foyer (no rain or wind. We live in AZ), and I put one of those LED flashing light necklaces from the Dollar Store in each of them. @Daisy, What a good idea! We shred newspaper for our compost pile and use it to start fires. We also use it for packing material and as a weed barrier in the yard under mulch. Works great! The comics have been used for wrapping paper here 🙂 Always fun! I’d say to use caution when using it for a changing pad, though, so the ink doesn’t rub off on the baby or the baby’s clothes. At least, my baby can be pretty squirmy and I’m afraid we’d both be covered in newspaper ink till we’d be done! I like the compost idea… I wonder if we could till shredded paper into our garden in the fall and it decompose by spring? Our dirt is SO poor (and HARD!) anything to fluff it up and help enrich it is welcome! Once we have our woodstove I’m sure we’ll use it for starting the fire, too. I love the gift bag idea, thanks! Put some newspaper at the bottom of the trash can! @Dawn, Hmmmm, interesting idea. I wonder if that would work for the bottom of the baby diaper thing. I was going to set a box of baking soda in there. I use a folded newspaper in my trashcan, between the trashcan and the plastic bag. It can help soak up an spilled messes from a broken bag and I think it also helps to absorb some of the nasty smells. I used newspapers to kill the grass in areas that I turned into flower and garden beds. I add shredded newspaper to the garden in the fall (and cover with the summer compost. I use shredded newspaper as bedding for the vermicomposting. I wrap my garden bulbs in newspaper when I bring them in for the winter. My nephew and I cut out letters from the paper to make story books. I always use newspaper to clean the windows and to line the winter boot tray. As you can see, I am always collecting the newspapers from work (as I rarely buy a newspaper!). Newspapers make for great weed control in the garden. Put a layer down under the mulch – it will control the weeds for a season and then naturally compost. I use old newspapers as bedding for my worms in my indoor worm compost bin. They eat up the newspaper along with produce scraps and turn it all into awesome compost that I will be able to use in my garden next year! I don’t know if someone already suggested it, but I know our 4-H club was collecting it for the animal shelter. Bury in the yard and feed to the worms. Newspaper ink is now soy based and is edible. So I use the b/w pages with the least print for draining foods , french fries, bacon etc. I use the paper as an insulator around cold items when I do not wish to bring a cooler and just have them in a bag, example a bottle of liquid, you just tape it around in a decent sized roll, the trapped air helps insulate. When I was younger we had a wood burning stove and a newspaper log roller. It was a hand cranked device that reminds me of a large version of a toothpaste tube squeezer with a trough. YOU would add pages and when it was the desired thickness you would tape it with masking (paper) tape as it burns. When I change my car oil–I use newspaper to both clean out my motor oil drain pan , etc but as a spill clean up. I use pretty colored pages to make into giftwrap, Sunday cartoons are wonderful for that. Colored shiny ads make wonderful hand rolled jewelry beads, remember your days of “quilling” back in school, like that.-It is a wonderful shipping spacer and I always use it to wrap dishes for a move. the white strips on the side are just right for making small lists where you can tear off items as you do them, no pen needed with you and fits easily in my wallet. If anyone likes any of the ideas let me know. I use newspaper instead of buying cat litter. I tear it manually in peaces. This way I spend $0.00 on cat litter! @lena parks, I use shredded newspaper for cat litter too. I actually use a paper shredder to finely shred it (on my teenage daughter’s chore list!) and toss it with a little baking soda to cut down on odor. I haven’t paid for cat litter in years! that so funny. I was wondering if I was the only one. xexe I tried to find a cheap paper shredder online for this purpose. ))) May be Crystal will post paper shredder deals some time. My grandfather was going green long before it was cool. He recycled everything–mostly from a mindset that nothing should be wasted. He would wrap our Christmas presents in the “funny pages”. Now that he’s gone, I often wrap a few presents for my son and nieces in the comics as a way to remember him and share with the kids memories of a great man they were never able to meet. While this is a little off your top and since you mentioned cereal boxes, I invert them when i use them as gift boxes, when they are flat they are easy to decorate and then you reglue them inside out. I also use the “waxed plastic like liner” to put under cakes after flattening it out and rinsing it off, letting dry and cutting with scissors, it can be cut into any size. It is easy to wipe off extra icing, to carry the cake on a large piece of cardboard lined with foil and to cut on the surface, the paper doesnt cut even when a serrated knife is pulled across it .I use small boxes, like the ones you get tea in to carry squishable food items in a bag, I am known for hand delivering brownies and carrying some in bagges lined up like inside standing on edge to fill the box . How is that for saving and frugal? I’m hoping to start a “lasagna garden” sometime soon, and newspaper is one of the key ingredients. Supposedly you just do layers of newspaper, dirt, leaves, compost, etc., and come spring I’ll have a nice place to plant vegetables! You can use the non colored newspaper as weed control in your garden! I like the diaper changing idea. Especially for the major blow-outs that make the changing pad cover gross. I have found the best cat litter is shredded paper. This is a good way to be resourceful and not throw away the Sunday paper. By using shedded paper, the cat does not scratch dust & cat litter everywhere. It is so easy to change the catt litter as well. You don’t have to dig through cat “stuff” you just throw away the whole batch and replace with more shredded paper. Hope this helps!!! I shred mine into my worm farm and have used them as a weed barrier around my flowers and garden. Also use comics as wrapping paper. I like the idea for using them under a messy kid’s high chair- once my baby starts on solids I might have to try that! I’ll be using my collection to start a garden plot this autumn. Lay out paper, weight it down, cover with mulch (leaves, old straw from the animal pen, etc.). Good ideas. We buy about 4 papers on Sunday for the coupons -I’ve gave them to my neighbors to read and I’ve deposited them in the recycling bin at home and at the school across the street for their fundraiser. What great ideas. I have a stack ready to go into the recycling bin, but I might try some of these out! You can also lay them down where you plan to put new garden beds and cover with leaves in the fall to get a good start in the spring with weeds pre-killed and a bit of compost or leaf mold on top. Wrap a hot casserole dish in newspaper to transport it to a potluck dinner or a sick friend. It keeps it nice and hot. I often put a beach towel around the newspaper to hold it all together. @Lana, Thanks for this idea! I have used towels before, but newspaper would add another layer of protection and insulation. We had an earwig infestation in a few of our garden pots (we did an all-container garden this year). Rolled up, rubber-banded and wet, and set next to the base of the invested pot – the earwigs will go into the rolled up paper rather than stay in the pot. Then they can be disposed of in the morning. Rolled up newspaper also does well for a humidifier in a pinch. Roll it up and secure with a rubber band, then stand it up in a bucket of water. Make sure the paper rises above the water line by at least a few inches. The paper draws the water all the way up, the water is drawn into the dry air… which dries out the paper, draws up the water into the paper, water into the air… repeating itself over and over again as long as there is water in the bucket! @Genevieve (MamaOnABudget), Love the humifier idea! Thanks for sharing it. I like to wrap a hot casserole in newspaper to transport it. It will stay nice and hot. You can wrap a beach towel around the whole thing to hold it together and protect your hands. After packing a cooler I cover the top of the food with a thick layer of newspapers. I’ve actually had things freeze in the cooler because it holds the cold so well. We shred it in a paper shredder and use it in our compost pile as ‘browns’. I keep a small stack handy for messy craft projects like the recent homemade Aboriginal digeridoo made by my 10 year old! My local animal shelter is always asking for donations of old newspapers and will take all they can get! They line the little boxes with newspaper before putting the litter in to make cleanup easier. Whoops, not “little boxes”, litter boxes! We saw an idea for making newspaper pots for starter plants. I think it was on youtube. I forgot this trick my brother gave me a few years ago. Use newspaper to wipe the mirrors when you clean. They leave a streak free shine. Line the cat litter box, if you are still using regular cat litter. My vet suggested that! I used some to make balls for a couple different craft projects. Just ball them up to your desired size and wrap them with freezer tape to form somewhat of a ball. I hot glued faux moss to several and they look perfectly round! I also wrapped yarn around some and plan on using them as Christmas tree ornaments or decor. They, too, look round enough for me, for being free! Those foam craft balls can be expensive, even with coupons. @Linda, I agree that they are too expensive. It’s nice to know of an inexpensive alternative. I sometimes rule out interesting craft projects because I don’t want to spend that much on materials. I use newspaper to cushion items such as presents when shipping them. Substituting newspaper for shipping peanuts works great! @Joy, And I believe that parents with young children should avoid packing peanuts at all costs. So messy! @Kayla, I’ll have to try this! We live on a farm, so in the spring we line the large water trough (no water in it) that we raise the baby chicks in. We roll it up with chicken manure and dispose daily, so the chicks have a clean and dry place every day. Winter- we use newspaper to start the fire in the wood stove. So newspaper is a value commidity around here. Because we live in a small town with a small newspaper, sometimes we run out. I got in trouble a couple of years ago for “stealing” newpaper from the recycle center. This was during the chicken time, so I told the man I would bring it back later. Ha/ ha. He was not pleased. You can turn newspapers into a handy portable seat for sporting events or camping (my mom taught me this trick when I was young in Girl Scouting :). Take your newspaper and cut them into thick strips. Weave the strips into a square the size of seat cover you want. Put that into a black garbage bag and cut to size. Seal it all with duct tape. It actually works as well as a lot of seat warmers, is water proof (thus the point of the garbage bag) and will last for years. @Erika, Thanks for the idea! Very resourceful! I use newspaper for the bottom of my rabbit’s litterbox and put hay on top instead of buying litter. It also is fun to make art. I made a mixed media poster of Laurel and Hardy by tearing small pieces of paper to make varying shades of gray for their faces and painted the rest. I’m sure it’s already been said, but we use it to start fires in our wood stove and when we have bonfires. I also use the comics to wrap gifts when I’m out of wrapping paper! Our veterinarian’s office is ALWAYS asking clients to bring in newspapers, and old towels and old sheets. They line the cages for the animals in the back who are recovering/waiting for surgery, etc. I use old newspaper, a couple of window screens, my shredder and a thrift store blender to make new paper! A couple of drops of bright food coloring and you have a nice paper for stamping cards on! In the fall I buy flower and herb seeds on clearance from the gardening section so my spring cards have seeds all ready for planting in them! All the receiver has to do is plant them in a pot and water! @Julia, As long as you get the pieces small enough to get pulpy when you wet them you should be fine. Give the kids a bucket and a stack of newspaper and put them on the porch and let them tear it into little pieces! I got my paper recipe from the internet, some call for a “silk screen” for straining but I found a site that said a used old window screen worked well and being the frugal person that I am I went that route and have never had any problems. @[email protected], They are very cute, Tammy! Thanks for sharing. I have always recycled newspapers as long as I can remember. But a couple years ago I realized our local vet used them to line the dog & cat’s cages in the back. So….now I bag them all up & take them to the vet! It helps everybody. My parents owned a seafood business in Texas and when relatives from Minnesota would take fresh frozen seafood home with them, my mom would first freeze it in zippered freezer bags, wrap in newspaper, then put in any other plastic bags. The paper would keep shrimp, fish, etc. from piercing through the outer bag and insulate it enough to stay frozen for the long trip home. Newspaper will insulate to keep anything frozen or cold for hours. I noticed from several posts that it works for keeping hot stuff hot as well. My family has always used newspaper when making large batches of sugar cookies. It’s easy to spread one end of the table or another flat surface with a couple of layers of newspaper, then lay the cookies on them to cool. That way, you don’t have to worry about having enough cooling racks, and it’s a little less to wash, too. Great article! As a former newspaper reporter, it was our custom at office parties to wrap gifts in the Sunday Comics. They are colorful, seasonal, sometimes have great pictures in them, coordinate with any color of ribbon or bow. I rarely purchase gift wrapping paper any more and just save up my comics for gift-giving occasions! Also, newspaper makes a great substitute for tissue paper if you’re placing your gift in a “store-bought” gift bag. When using newspaper for picnics or tables outside, you need to tape down the sheets or they blow like crazy! (VOE = Voice of Experience!). I use newspaper to clean my mirrors and windows. Just use your regular spray and then I scrunch of the newspaper and use it like a paper towel. Although my fingers have a little ink on them, it always leaves my mirrors and windows streak free and absorbs the spray quickly! JUST A SUGGESTIONS TO USE THE OLD NEWSPAPERS. I BELONG TO A SCRABBLE CLUB AND IT IS GOOD TO FIND WORDS THAT COULD COUNT FOR MANY POINTS AS YOU PLAY THE GAME. READ THEM FIRST, USE THE WORDS, THEN CHALLENGE YOUR OPPENT. IT IS FUN. IF YOU HAVE CHILDRES STILL IN SCHOOL, HELP THEM IN THE SPELLING GAME, FIND A WORD IN THIER HOMEWORK , TELL THEM TO LOOK IN THE PAPER FOR THAT WORD, WHEN FOUND BY THE CHILDREN REWARD THEM WITH SOMETHING SIMPLY AND THE KIDS WILL LEARN FASTER AND MORE, BECAUSE IT IS A GAME FOR THEM. TRY IT (IN FACT ANY AGE CAN DO THIS) HAVE FUN. If you iron the newspaper it sets the ink and it won’t smear all over your hands, or baby or whatever. I just love all the great ideas you have all given me, and I wanted to add one of my own. We have an older dog, who needs wee-wee pads because of his accidents. First I lay down a plastic shopping bag (always seem to have too many of them laying around), then I cover the bagged area with 2 layers of newspaper, and tada…an upcycled wee-wee pad. In our area the wee-wee pads sell for around 8.99 for a 12 pack, by recycling our old newspapers we are saving alot. This can also be used for training puppies as well. Hope this helps someone else. I read in a book that you can use old news paper as fire logs by bundling them with rubber band and then soaking them in water and letting them dry out. I made a few this summer and have yet to try them since it has been way to hot for a fire.